First previewed at Comic-Con last summer, Mondo's "First Turtle" vinyl figures are now available for pre-order. 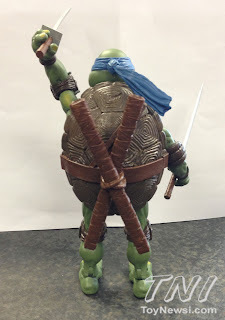 Based on Kevin Eastman's original drawing that inspired what became our familiar team of four, the figure is available with several paint variations to appeal to all fans. 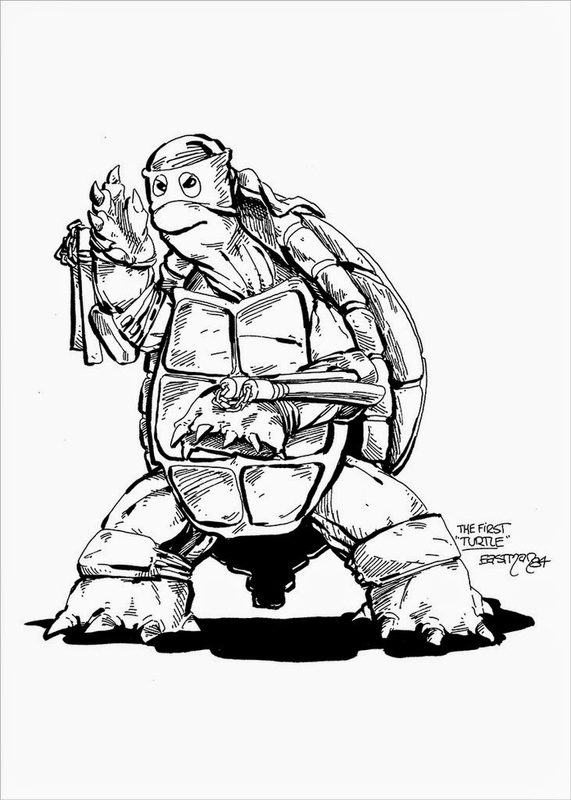 Kevin Eastman's original "Ninja Turtle" drawing. 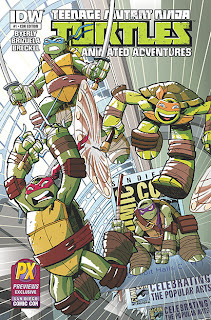 As pictured above, there is a black and white version, a full-color with red mask version, and a full-color with orange mask version. Each variation is priced at $65. 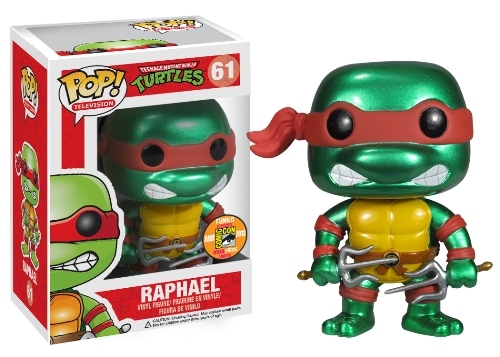 A Deluxe Limited Edition version, priced at $100, featuring the black and white paint style with interchangeable heads (black and white, but with a red mask and orange mask), was also briefly available, but has already sold out. Check 'em out and pre-order here! 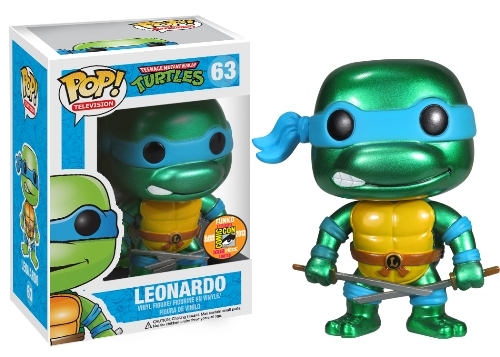 This past weekend, McDonald's restaurants launched a new Happy Meal promotion featuring a set a six Teenage Mutant Ninja Turtles toys based on the Nickelodeon cartoon. Each toy features a figurine on a base, along with an additional spin-top base. Spin toy figures toward each other and have a ninja battle! 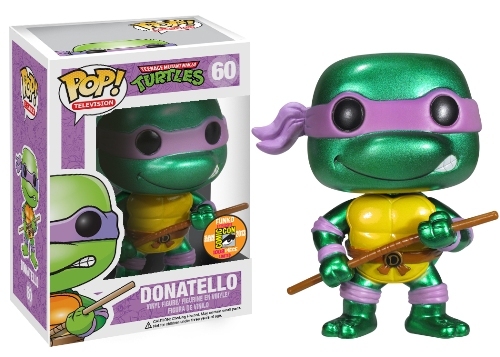 The six figures available are: Leonardo, Michelangelo, Raphael, Donatello, Shredder, and a Foot Soldier. Look for them at your local McDonald's for the next 3-4 weeks. 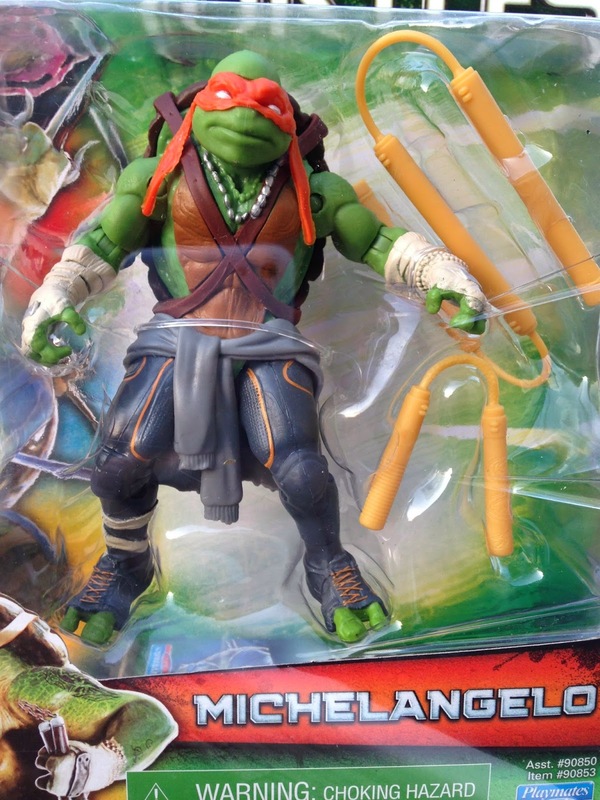 After getting various levels of reveals over the last few months, we finally have some clear pictures of the upcoming Teenage Mutant Ninja Turtles movie figures in their retail packages. 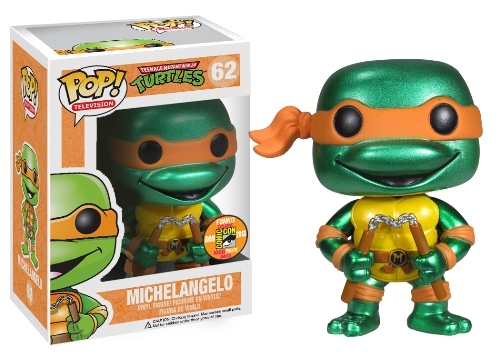 Interestingly, these figures still have the "Ninja Turtles" title, while the movie has been officially changed to "Teenage Mutant Ninja Turtles." Check out these and close-ups of other figures at ActionFigureFury.com. 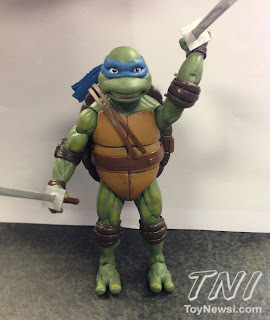 TMNT 2014 Movie Action Figures Revealed! 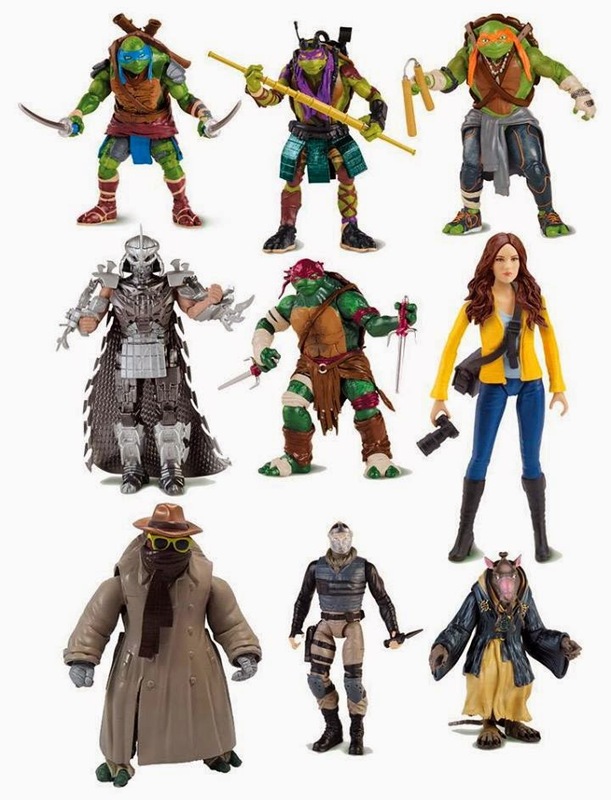 Here they are, finally, with no funny business or bad angles - the upcoming Teenage Mutant Ninja Turtles movie action figures. 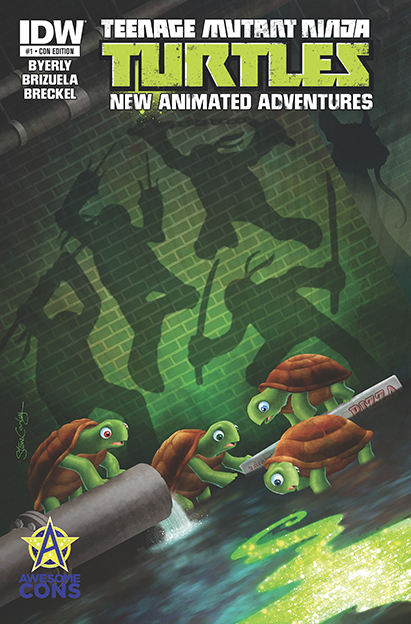 The nine figures of wave one consist of the four Turtles, Splinter, Shredder, April O'Neil, a Foot Soldier, and Undercover Raph. 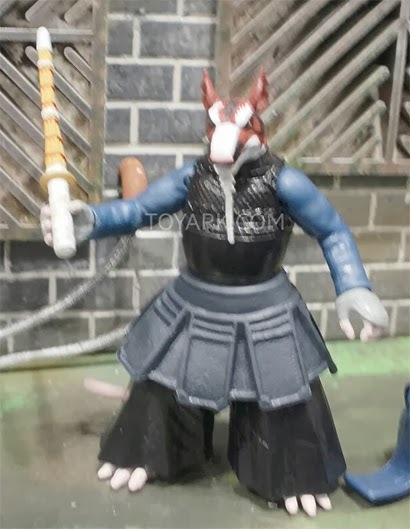 Of particular note is Splinter, as this is the first good look we've had of his character design. Unfortunately, this compilation doesn't provide a very accurate look at the scale of the figures, although they look to all be about the same size. 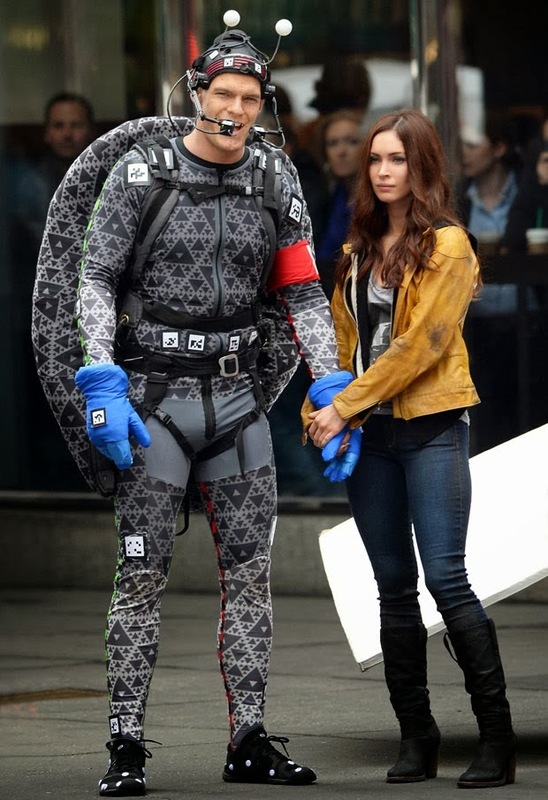 If this is the case, it won't be very true to the movie, which, as we've seen in the trailers, features a very large size difference between the Turtles and April. 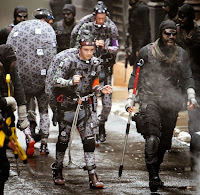 Although we haven't seen a clear shot of Splinter in the trailers, he is expected to be quite small, given that he is played by actor Danny Woodburn. 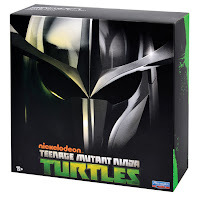 We've seen the movie classics figures and the Half Shell Heroes, now here's a glimpse of what Playmates will be offering in 2014 for their standard TMNT line based on the current cartoon from Nickelodeon. First up, it's a blimp! 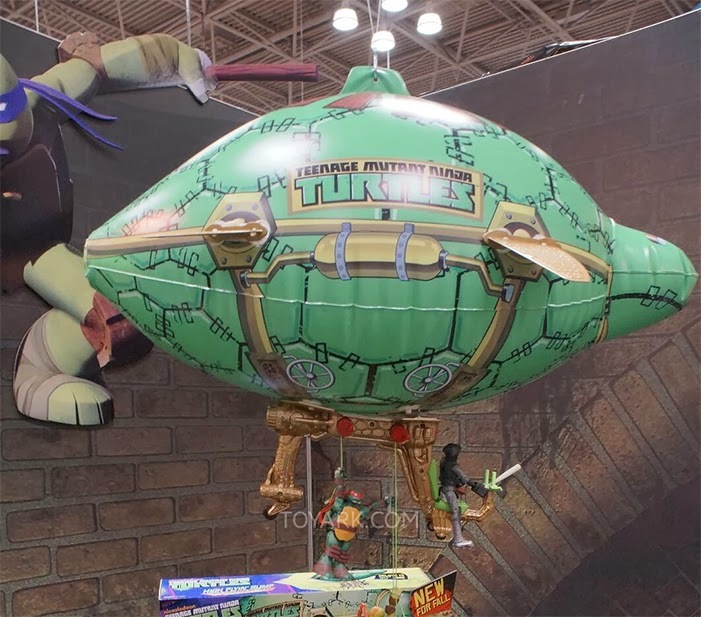 The classic Turtle Blimp has been modernized, but it's still inflatable fun. 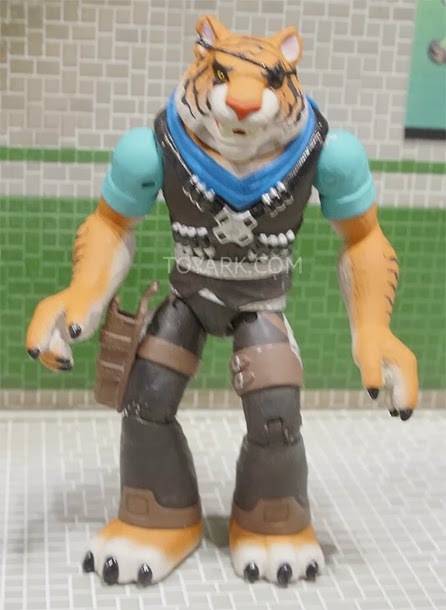 And some pics, also from ToyArk.com. Check out more! If you were disappointed with the 1990 movie Turtles from yesterday, this might make you feel a bit better. 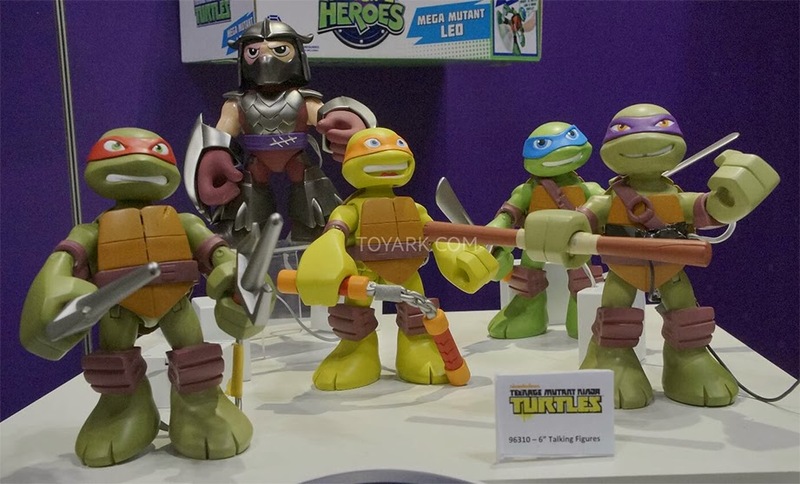 Playmates is also revealing at Toy Fair a brand new line of stylized figures that are targeted at a younger market than the usual 7+ that the standard toys based on the Nickelodeon toys are targeted for. 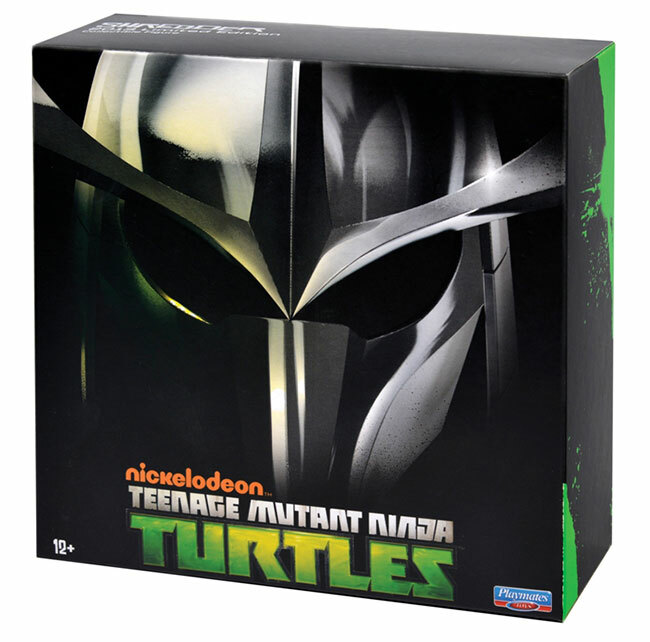 The main assortment of toys in this line will have 2" figures, plus vehicles and playsets. 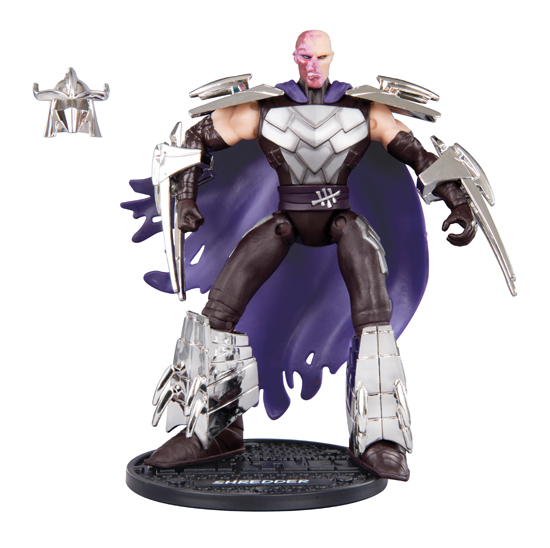 These are similar in concept to the Mini Mutants line Playmates briefly introduced following the 2007 animated movie. Also included in this line are larger 6" talking figures. These figures are currently scheduled to start shipping in June. Get more pictures over at ToyArk.com. 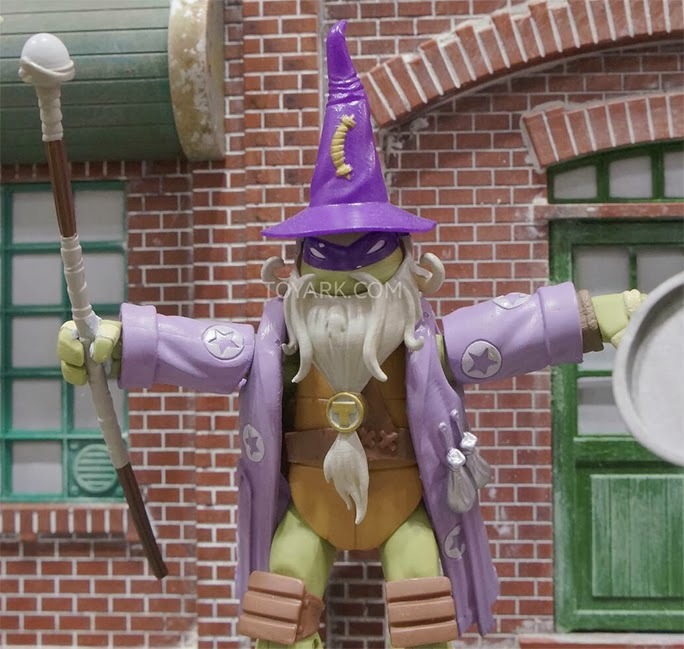 Last year at Comic-Con, Playmates impressed the crowd with a slide showcasing an upcoming line of classic figures based on the first TMNT movie. 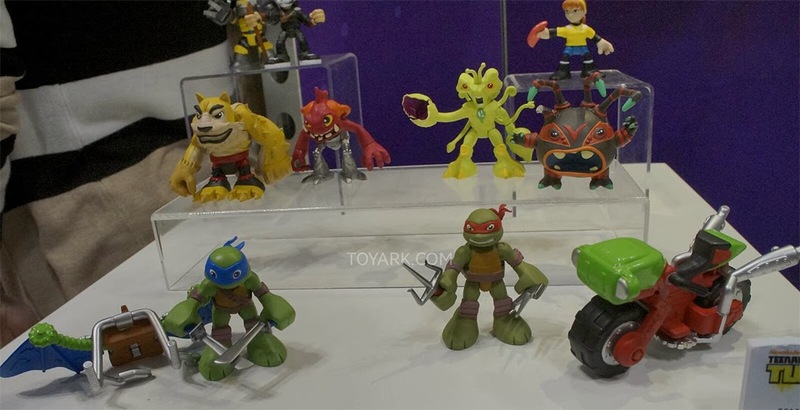 Now at Toy Fair we're getting a better look at all four Turtles in this line. 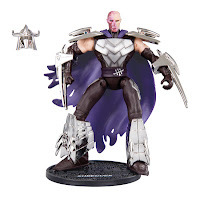 Unfortunately, the mass production version of these figures seem to have lost a lot of the awe that the prototype shown in the early pictures elicited. 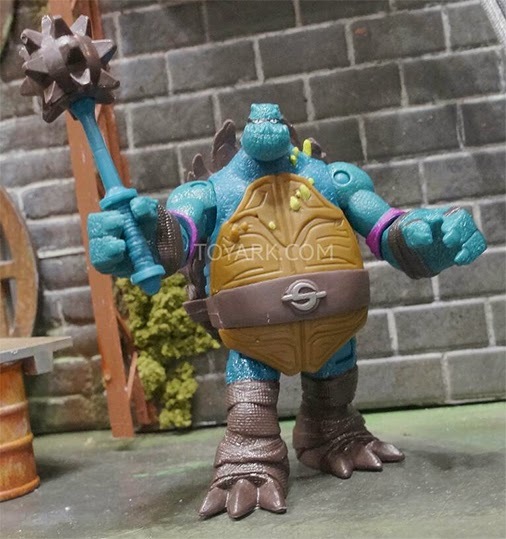 These figures are in the same 6" scale as the classic cartoon Turtles from Playmates and are expected to hit shelves in the Fall. Note to Playmates: Movie Mike never had chucks with chains. You can get more photos of these figures over at ToyArk.com. There is a lot more news coming out of Toy Fair, but my current schedule is probably only going to let me update you with one piece a day. 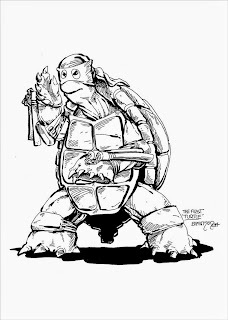 If you haven't already hunted down everything else, just hang tight and you can look forward to Turtle tie bits all week! 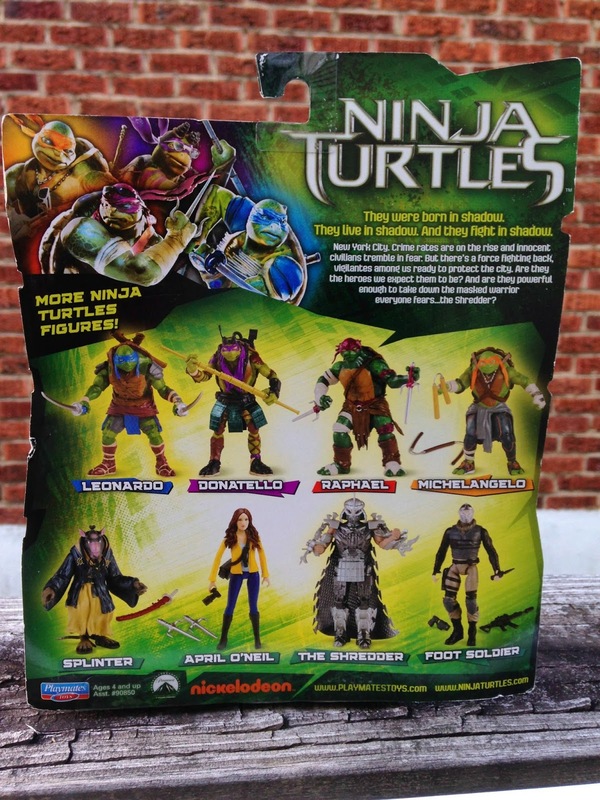 And here it is - finally, our first real picture of the 2014 "Ninja Turtles" movie toys! 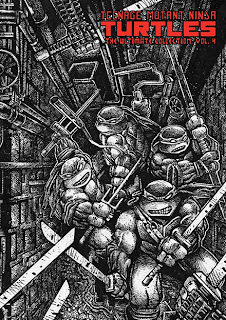 Here we see Raphael, Donatello, and Michelangelo. This picture is via Stoer Magazine at the Nuremberg Toy Fair. These are apparently the 12" scale figures. Happy New Year! 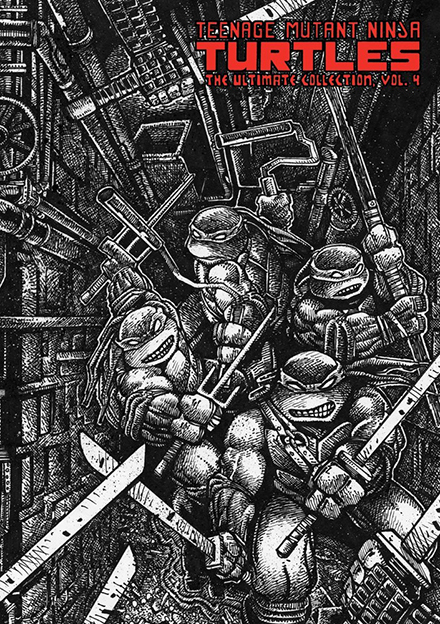 2014 has arrived, and it's looking to be a big year for the TMNT. The biggest event, of course, will be the release of the new live action movie, currently scheduled for August 8 (still my birthday). 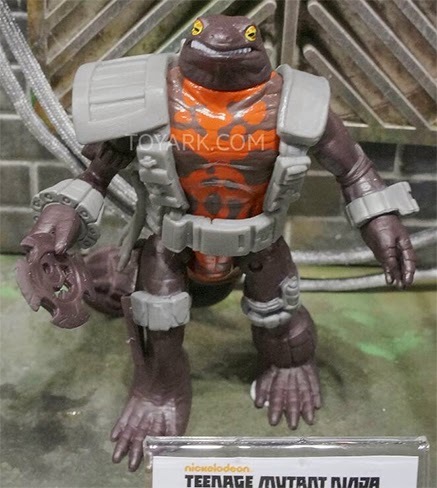 Although we have yet to be shown what the Turtles will look like in their CGI forms, toys for the movie have been in development for awhile. 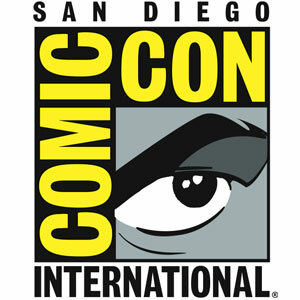 And now is beginning the season of Toy Fair season. At one such Toy Fair in Russia, some lucky individuals were able to get a glimpse at these new figures. Unfortunately, pictures were not allowed. However, one person put together a fairly detailed report of what he saw. 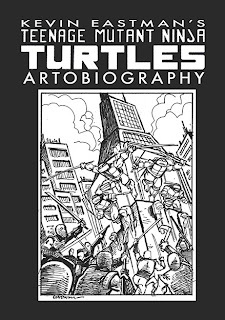 Amongst the figures on display were the four Turtles, Splinter, April, Shredder, and a Foot Soldier. 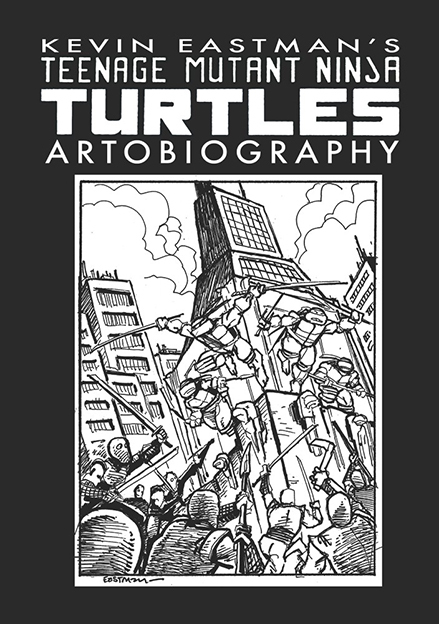 The Turtles are noted to each have different physiques and different clothing. The designs are described as being "traditional," whatever that might mean. 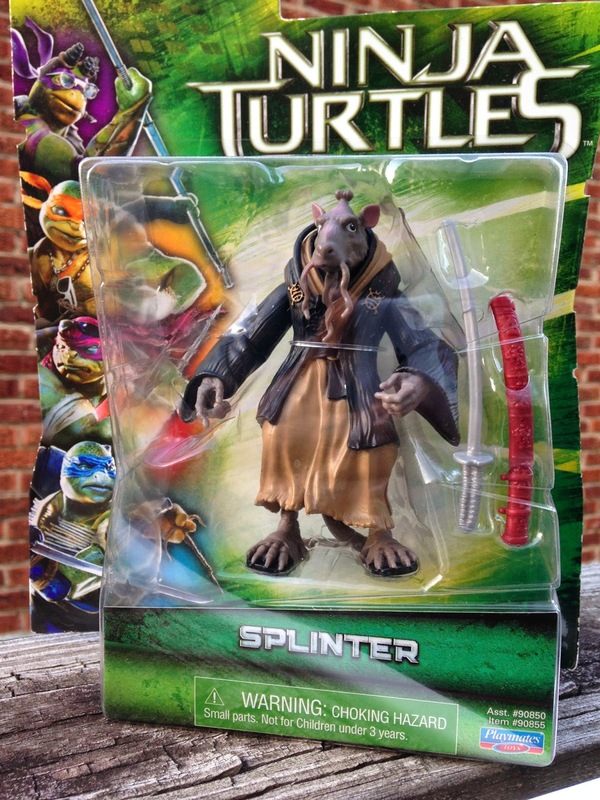 Splinter has more of a "Fu Manchu" vibe going on. April is dressed like we saw Megan Fox dressed in the many set pictures taken during filming last summer. However, the figure apparently doesn't look much like her. 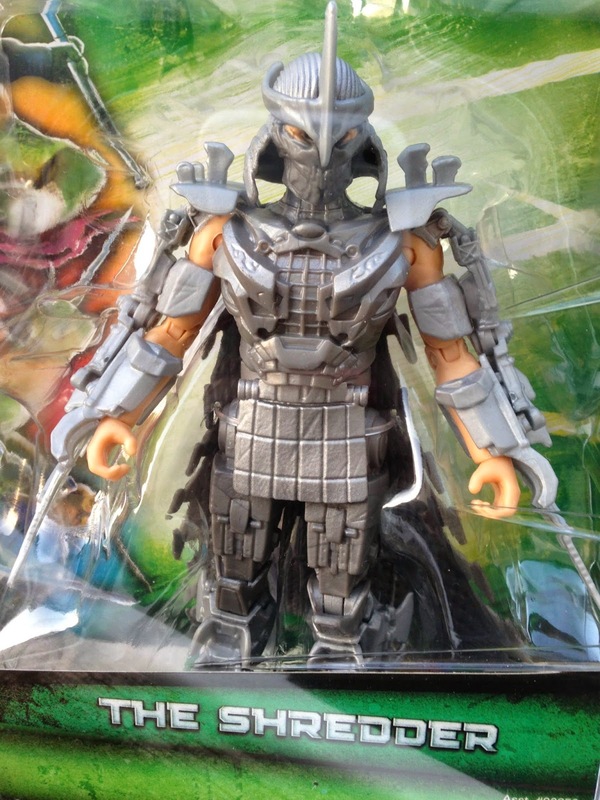 Shredder is described has having an abundance of pointy edges poking out of him everywhere. 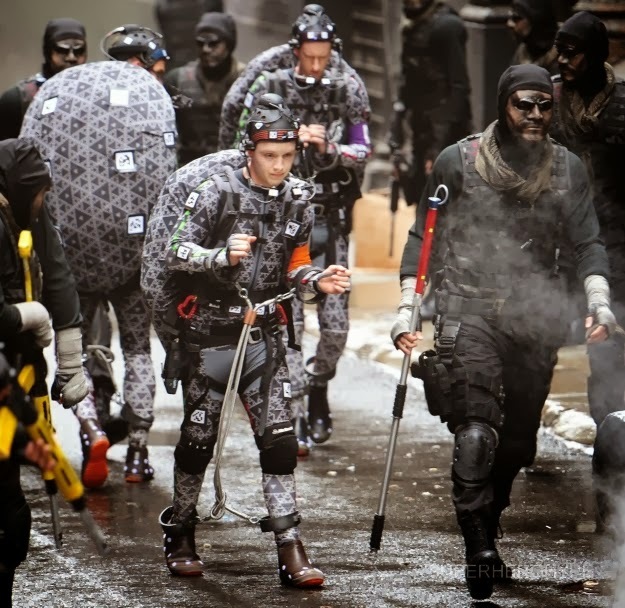 The Foot Soldiers mimic the guys in drab that were also seen on set. Again, you'll want to read the full report to get the best feel. 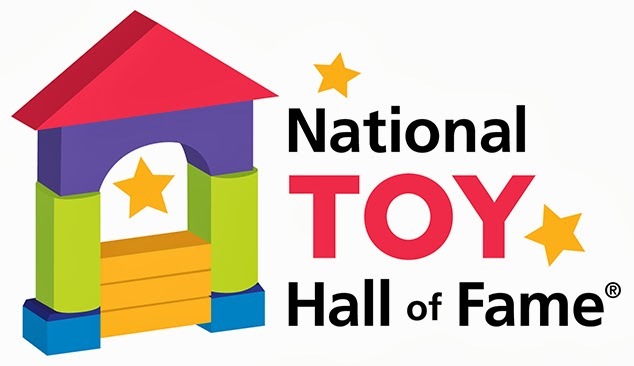 More toy shows will be taking place in the next couple of months, including Toy Fair in New York. 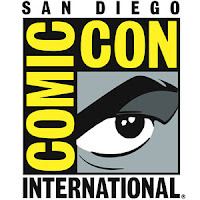 If we don't see the action figures ourselves sooner, we definitely will then. Like all other TMNT action figures ever, these are being made by Playmates Toys.